Redken Shades EQ | hair, there and everywhere! I probably should have broken these down into 2 posts, but whatevs … let’s get right to it! Yesterday I went and got my Redken Shades EQ put on again. I got it done in March of this year and loved it! Even thought it was a demi-permanent color, I can tell it gave me some lovely red tones that have lasted up until now. The application of the demi-permanent color also helped my porous ends, which was presented to me by less breakage. Anyhoo, all went well until the roller set. Normally she will blow my hair out, but since I just used direct heat last week, that was not an option. Instead of wetting my hair with each roller application (I would have stood for wetting my hair in the 3 sections!!! 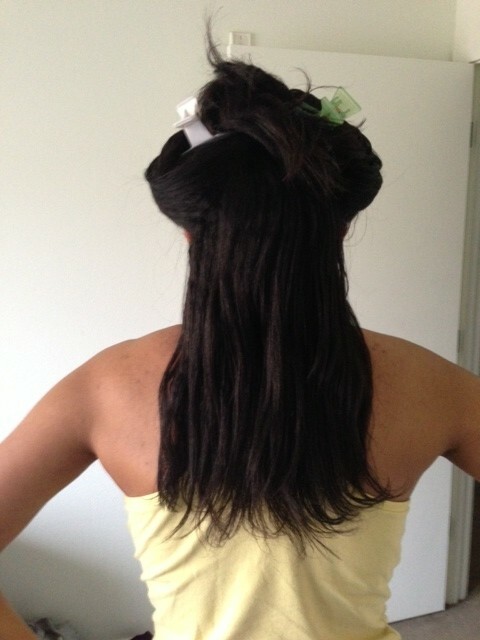 ), she detangled and combed hair with a rattail comb while it was half dry, which can increase breakage! I wanted to say something, but I didn’t! I know, I know .. I should have spoken up! The rollers weren’t placed in a methodical way … just whatever way the fit in. Needless to say, I was not pleased. I took me about an hour to dry, probably because half my hair was already air-dried 80% when I got under the dryer with my rollers. She took them down, shook my curls out and sent me on my way. To add insult to injury, she only took the discount off one salon service (the color) when I thought it was the total bill. It was $62+ tip! Nope, nope, nope! This is why I don’t get down with stylists on a regular basis any more! I felt that my hair was not treated with the utmost care and the results were subpar! I can get subpar results at home for free!!!!! Additionally, my hair was not deep conditioned and I can totally tell by the feel of it today. Honestly, unless I am going to get a flat iron, I won’t be going back to that salon. I can apply my Clairol Colorgloss at home as well as do horrible rollersets. Lesson learned! When I got home, I just wanted to scream! I just knew that my hair was thinner (I wouldn’t want to know how much hair I actually lost), it felt dry and when I combed the hair out, it just fell flat. I was tempted to wash and re-roll it, but I thought better of it! I immediately applied some moisturizer and serum and put in my satin rollers to try to salvage it! 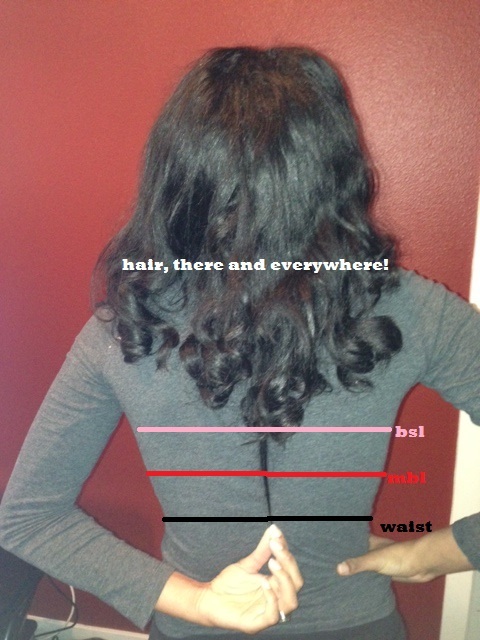 My next relaxer will be in mid-March 2014, when I am 14 weeks post. I do not plan on using direct heat and continuing my regimen to mitigate any damage done by my trip to the salon yesterday (can you say “thicken?”) Winter is the time that my hair grows the fastest, so I will try to maximize my length retention. I will be going home next month and I am deciding whether I want to go to my old salon and get me a $10 roller set (of course I will pre-poo before)! I still have 5 weeks to make up my mind! Since my roller set turned out quite crappy and I had to roll on satin rollers (which makes curls tight), I couldn’t get a full length check shot, so I thought I would stretch a piece of hair so you can see where it’s at! So around 5:20pm this afternoon I was about to tie my hair up for the evening and while detangling I noticed that my hair was shedding! It was not too bad, but it was not normal for me on the day after a roller set. Between the shedding, the dryness and the anger I had towards my hair, I decided that I needed to do a quick Wash Day. I was not going to see what happened to my hair as the week progressed. I did a coconut pre-poo with safflower oil and cheapie conditioner. To combat shedding, I added a tea rinse to my scalp and hair and sat under the dryer for about 20 minutes. I co-washed with my Ion Conditioner Wash sample pack and did an in-shower conditioning treatment with my Alterna Caviar conditioner. I did a deep conditioner with L’Oreal Total Repair 5 for 25 minutes. I did a final rinse with Roux for 1 minute. My leave-ins were as normal. I did the faux air dry method where I tied my hair back with a scarf and let it hang. I think I may do these for the next few weeks, depending on how the breakage this week goes. When it comes to breakage, my hair prefers to be roller set, but I think my hair could use a manipulation break for a while! Here are a few pictures. The end result was not that bad … I still have a rather full hemline and my hair still has some thickness to it, so all was not ruined yesterday. I think that I will be incorporating tea rinses into my regimen for a little while, to combat shedding. Sorry they came out blurry and it appears there are some gaps in my hemline … there isn’t, it is just how the grainy self-portrait came out! 1. I’M GETTING MY HAIR COLORED! – That’s the most exciting news of all! r. Lately, my hair just hasn’t been giving me life. It’s nice, but I feel that I am missing some long-lost pizzaz which only some color can bring! I used to be the queen of color back in college! It has been almost 5 years since I have had any type of color (semi-, permanent, demi-) in my hair because of the damage that was done when I wasn’t taking care of my hair. I have been toying with the idea of coloring the top 1/3 of my hair. I have been too chicken to do it, but I researched some coloring techniques and decided to go with the Redken Shades EQ semi-permanent color. It won’t lift my hair, but it will add a touch of color and gloss to the area I choose to color. Since the area is already lightened in some areas, I think it will look good! I am going to do a honey brown and see how that works! I am getting it done tomorrow at Ulta along with a blow-out. This is a treat for all my hard work! Sarah will be doing it, so I am eager to see the end result! 2. I DID A TRIM! – Literally … I did the trim. It wasn’t due to breakage or anything, but Monday evening, I was M&Sing and said to myself: “Hmmm … I could lose the last 1/2 inch of these ends for my fresh blowout” so I went to the freezer where I keep my shears and did it. I cut the bottom layers even and now the V-shaped hair that I have been rocking for so long is now a U! I also wanted to trim the bottom layer evenly. This relaxer cycle I knew that I wanted to even things up a bit, so I figured now is as good a time as any. So now I am back to the area between BSB and BSL! 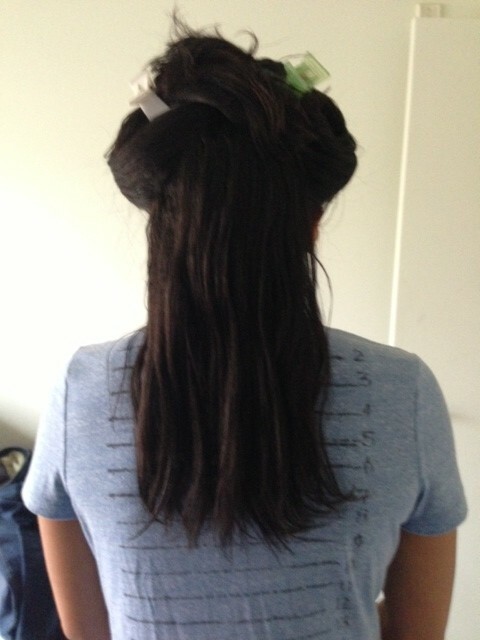 Photo after Nathan finger combed hair … so again the ends look a bit wonky. 3. I am deferring my relaxer until June 1st – Since I am going to go to NC in June, I thought that I would just have Kim do it when I was 14 weeks post. I am just not comfortable relaxing my hair 10 weeks post. I don’t think that I will have enough new growth to even justify it (mind you, I am used to stretching 12 weeks or more, even when I wasn’t on a HHJ). I will just go to Jeanne and get a roller set and deep conditioning while in Hawaii. 4. I have been wearing my hair out! – I wear my hair out an average of 2.5 days a week (hahha!) I am really at the point where I enjoy my hair and why not show off the fruits of my labor?